When you are unable to eat your fish right away, the best option you have is to freeze it and eat it later. Freezing fish can make sure that you preserve the fish for later use. You do want to be wary of the way you freeze your fish as it can go bad in the freezer without proper care. The first thing you need to remember is that every fish you catch needs to be kept alive, chilled, or put on ice after it is caught until you get it home to prepare it. The next thing you need to do is to clean it as soon as possible to keep its flavor. As a side note, a whole fish can be kept for up to one day as long as it is chilled or on ice. After you clean, fillet, and steak the fish the way you want it there are several ways to refrigerate and freeze it. Wash fish and remove scales – remove the scales by gently scraping from tail to head using a dull knife or filleting knife. Remove entrails - cut the length of the belly from vent to head to remove the insides. Cut just above the collarbone to remove the head, and use the edge of your cutting board or table to break the backbone. Remove the dorsal fin – slice the flesh along each side of the fin and pull out. Avoid using a knife of scissors to trim the fins as it will leave bones at the base of the fin. Wash the fish thoroughly with cold running water. Appropriately dress the fish – cut large fish into steaks or fillets. Cut down the back of the fish from tail to head, then cut with your knife flat against the backbone to the tail to cut fillets. 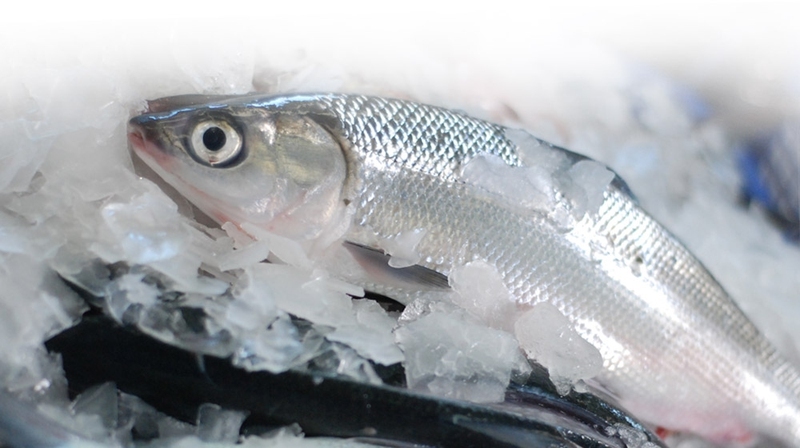 Be sure to pretreat your fish to improve the quality of your frozen fish. There are two types of fish – fat or lean. This is determined by the amount of fat in their flesh. Fat fish: Dip fat fish into an ascorbic acid solution (2 tablespoons crystalline ascorbic acid to 1 quart cold water) for 20 seconds to control flavor change. Lean fish: Dip lean fish into a brine (1/4 cup salt to 1 quart cold water) for 20 seconds to avoid drip loss during the thawing process, this process will also firm your fish. Choose one of your favorite methods to package your fish for later. If you plan to use your fish within a day, store them in the refrigerator. However, if you plan on using them at a later date, freezing your fish will keep them fresh. Remember to place freezer paper in between the fillets or steaks to prevent them from freezing together. There are many ways that you can freeze your fish for later use. Here are 5 of the best ways. Keep in mind that some fish such as bluefish, herring, mackerel, and sardines do not freeze well. Dip the fish in the lemon-gelatin glaze, drain, and wrap in freezer paper, and then label and freeze. Make the lemon-gelatin glaze by mixing ¼ cup lemon juice and 1 ¾ cups water. Next, dissolve one packet of unflavored gelatin in ½ cup of the mixture and boil the other 1 ¼ cups of the mixture. Mix both portions together until cool. Once it is cool, dip the fish. Freeze unwrapped fish in the freezer. Once it is frozen dip it into salted ice water and place back in the freezer. Repeat this process until a cover of ice is formed. Then, wrap the frozen fish in freezer paper, label, and freeze. Fill a shallow metal pan or a Ziploc bag with enough salted water to cover the fish, then place in freezer. Once it is frozen, cover the entire container with freezer paper, label, and freeze. If you do not want to use a glaze or water, simply rise your fillets in salt water and place them in a Ziploc bag or vacuum seal them, label, and put your fish in the freezer. Wash the roe thoroughly then place in freezer containers or bags with ¼ inch headspace. Label and freeze. Once you have caught or purchased your fresh fish, it is best to start the cleaning process as soon as possible. The sooner you are able to get your fish to a freezer, the more likely your fish will stay good. Air will destroy your fish. Any method you choose should be eliminating air from reaching your fish. A vacuum sealer is worth the money if you catch or purchase a lot of fresh fish. If you choose not to vacuum seal your fish, using a glazing method that puts ¼ inch ice on your fish is your best option. You can wrap your fish in plastic wrap and store in a plastic bag, but only if you plan on using your fish in a day or two. Freezing fish keeps it fresher than freezing land animals.